elicious and substantial meals aren’t served in a restaurant but in a dining room and guests consume them at a big table, in a family atmosphere. The cuisine is traditional and regional. All ingredients come from our garden and from the farmer. 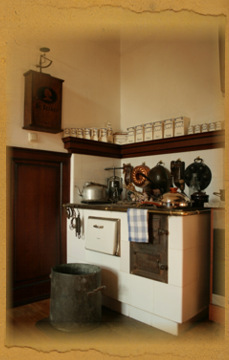 Bread, butter, cooked meat, cheese and preserves are made in the manor house according to old, tested recipes. 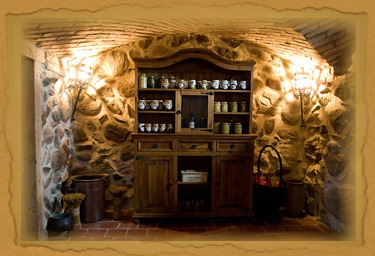 The cellar is full of preserves, marinades, fruit preserves, dried fruit and mushrooms, as well as delicious honey and fruit liqueur. Desserts, delicious coffee – real espresso or delicate cappuccino and homemade cake make the stay at the manor house unforgettable. he atmosphere of an old, country manor house with respect for tradition and old dressers, tile stoves, baking forms, forms for making butter, as well as other appliances corresponds with modernity. Kitchen in the manor house is equipped with a first-class household appliances.